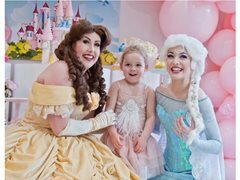 Magical Princess Entertainment are looking for Female performers to host children's birthday parties and poetry famous Fairy-tale Characters in Melbourne. Job involves: hosting games and activities, live singing, meet and greets, balloon twisting, face painting and interacting with children in character. We are also specifically looking for strong vocalists to portray our famous Snow Queen. -Strong vocal range, ability to belt is a bonus!